Dish of shallow form rising in a continuous curve to a square, roughly finished edge. Thrown from rough buff-coloured stoneware clay containing occasional large particles of iron oxide; slight ridge on interior below rim; turned almost flat base. Glaze coverage complete except for fingermarks around base and on part of exterior; smooth coverage inside, crawling on exterior where the piece has been turned. Remains of five spur marks on both base and interior. 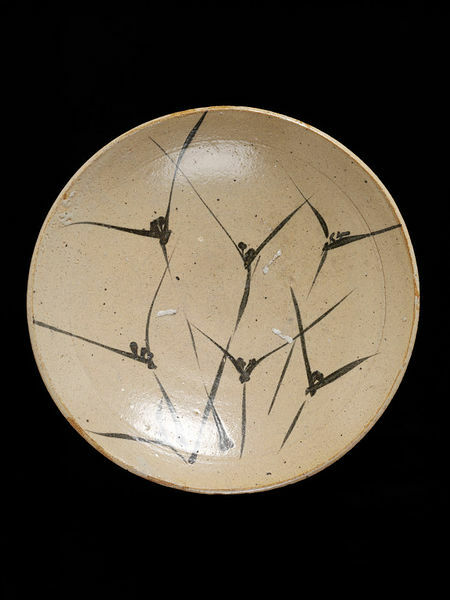 Ishiguro Munemaro was a pioneering figure in the world of modern Japanese ceramics. Designated a Living National Treasure in 1955, he was responsible for the revival of many classical Oriental ceramic styles and techniques. 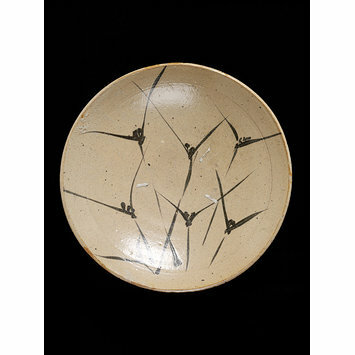 This dish imitates Karatsu wares made in western Japan in the late 16th and early 17th centuries. Roberts, Laurance P. A Dictionary of Japanese Artists Tokyo: Weatherhill, 1976, p. 56.